The state’s largest biomass electricity provider, ReEnergy, is asking manufacturing businesses to consider setting up shop next to its plants to take advantage of affordable heat and power. FORT FAIRFIELD, Maine — The state’s largest biomass electricity provider, ReEnergy, is asking manufacturing businesses to consider setting up shop next to its plants to take advantage of affordable heat and power. ReEnergy is seeking proposals from companies, particularly manufacturers, interested in setting up facilities next to one or more of its four biomass plants, located in Ashland, Fort Fairfield, Livermore Falls and Stratton. “Each of our power facilities is located adjacent to at least one large tract of undeveloped land and each could provide affordable electricity, thermal energy and other infrastructure support to a co-located industry,” said ReEnergy CEO Larry Richardson. ReEnergy’s plants buy lower grade wood and wood residues from loggers and mills and use the biomass materials to create electricity. 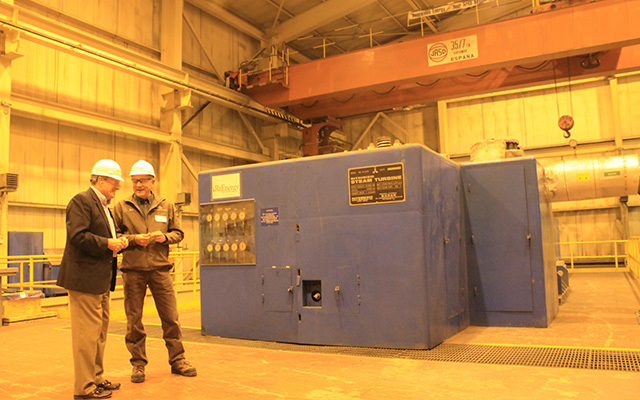 The company’s four Maine plants generate enough electricity combined to power about 154,000 average homes and employ about 100 people directly, while also supporting mills by buying what would otherwise be wasted, RIchardson said. But ReEnergy and other Maine biomass facilities have struggled in recent years to stay afloat amid fluctuating electricity prices. Four biomass plants — ReEnergy’s Ashland and Fort Fairfield facilities and Stored Solar’s West Enfield and Jonesboro plants — are being helped with a two year, $13.4 million aid package from the state of Maine. Biomass plants have been crucial pieces of the state’s forestry industry and co-locating businesses is important for the biomass plants’ own sustainability, said Charlotte Mace, executive director of Biobased Maine, a group focused on promoting manufacturing with renewable resources. ReEnergy has partnered with Biobased Maine to administer the request for proposals, and Mace said the opportunities for co-location with biomass plants are numerous — from heated greenhouses and indoor aquaculture to advanced wood-based chemical manufacturing. 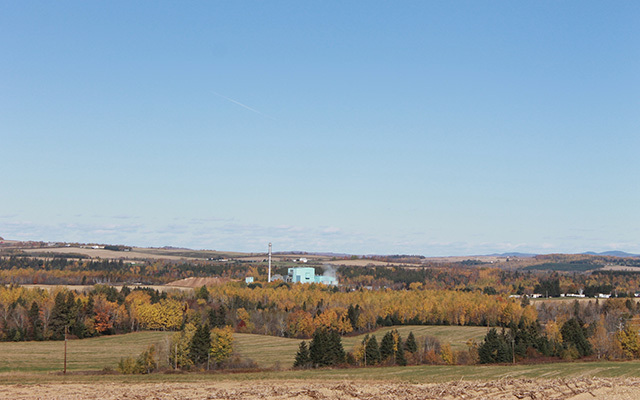 The ReEnergy biomass plant in Fort Fairfield, seen from Route 1A, generates about 260,000 megawatt-hours of electricity each year, enough to power about 34,000 homes. Biomass plants can sell power to co-located businesses cheaper than at grid-prices, and also provide steam, hot water and carbon dioxide for manufacturing. “This (request for proposals) process is designed to look at all of the technologies worldwide and pick the best ones for these facilities,” Mace said. Some of the bio-based manufacturing opportunities also could involve buying more wood that currently does not have a market after the collapse of the pulp and paper industry, Mace said. For instance, she said, there is global interest in PLA or polylactic acid, a type of biodegradable plastic that can be made from extracted wood sugars. Proposals for the co-location are due by Nov. 30, and ReEnergy could choose partner companies by year-end. Mace said she also is working on a similar co-location process with the Sappi paper mill in Westbrook. Those proposals are already in and are being reviewed, she said. Whatever businesses may end up co-locating at ReEnergy plants, Mace said that it’s important to think about the state’s forestry industry assets and how they can be used in the future.